Tattoo (tatau) is an ancient Polynesian and Micronesian practice that is a deeply traditional part of social, economic, and aesthetic life. Tattoo is the permanent adornment of the human body. Tattoo vividly demonstrates status, rank and individual courage through the ability to bear pain. Tattoo artists were respected and honored, and they practiced their profession under the tutelage of the gods. 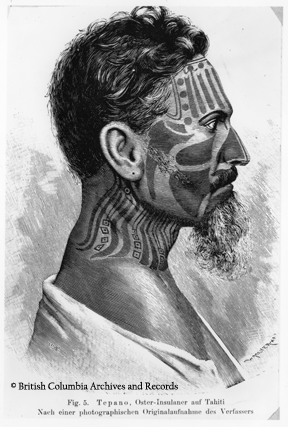 Tattoo reached creative heights of complexity throughout Polynesia but especially in Rapa Nui, New Zealand (Aotearoa) and Hawai’i. 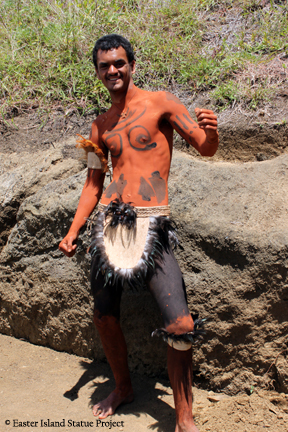 The earliest depiction of Rapa Nui tattoo on a man and woman is by Captain Charles Bishop in 1795 (Figure 1). Women were most often tattooed on the legs, arms, and torsos. 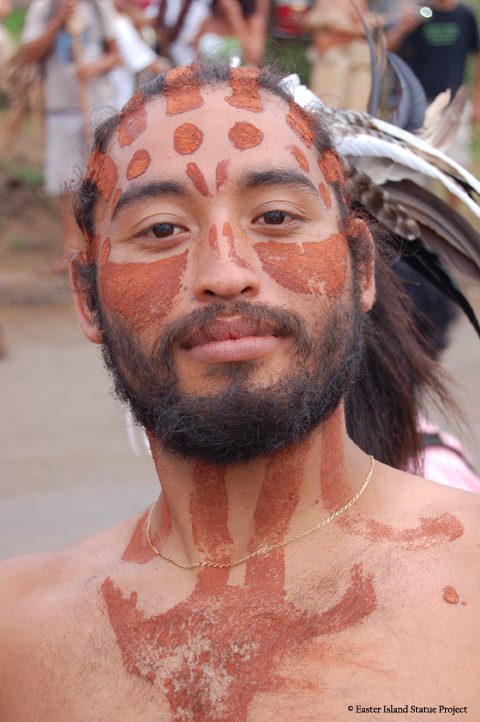 Facial tattoos were more elaborate and conspicuous on the men. 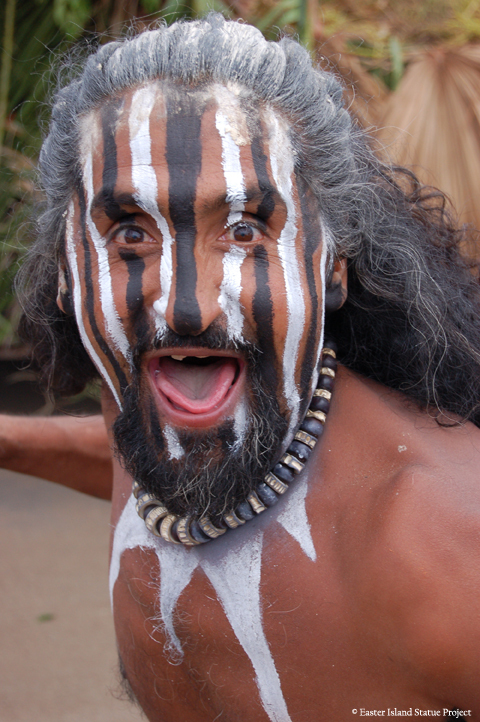 The most famous tattooed Rapa Nui man was called Tepano or Stephanus. A sketch of him made by H. Stolpe in 1899 depicts complex patterns on his face and neck (Figure 2). Some of these same designs are often found pecked into the stone surfaces of Easter Island statues. Neck patterns, including especially lines and curvilinear forms, are occasionally present on the necks, arms, faces and backs of some statues. These are all embellishments added after the statues were finished. Pigment, in sharp contrast to tattoo, is impermanent adornment. Rather than depicting one’s place or profession in society, paint is usually used on the body to mark an event or an occasion, such as ceremonies surrounding birth or death. 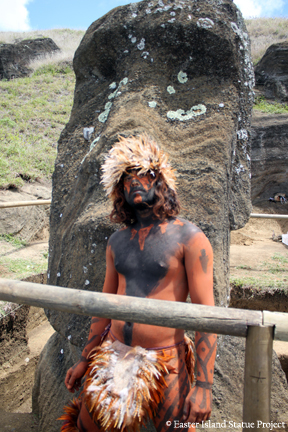 On Rapa Nui, red, yellow, black and white pigment was lavishly applied to the entire body, including the face and hair. Some statues were probably also painted for certain ceremonies. 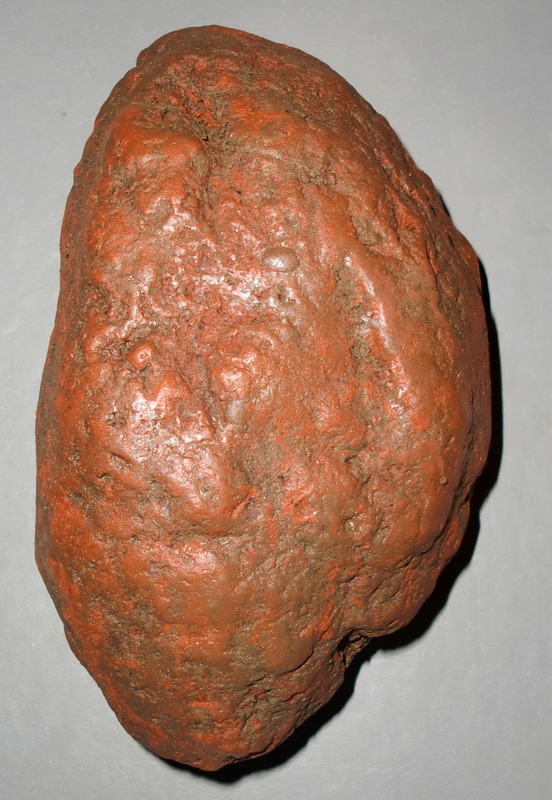 In our excavations, we uncovered a great deal of rich, red pigment, including one large concentration of it weighing 800 g. (Figure 3). 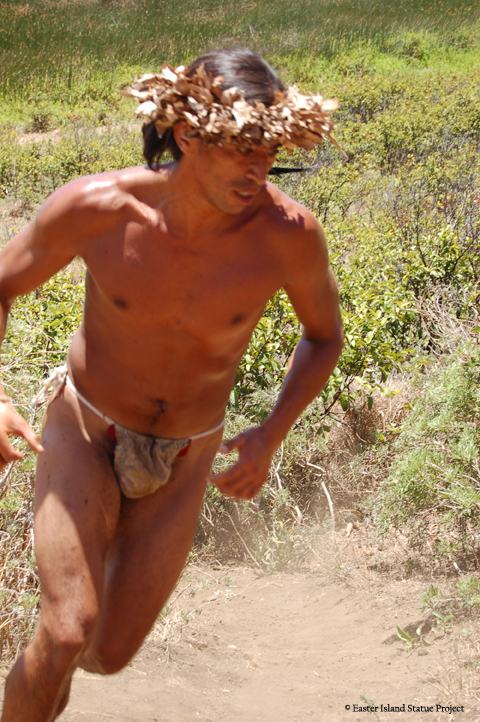 Ceremonial use of red paint found in our excavations may have been associated with burials also encountered. 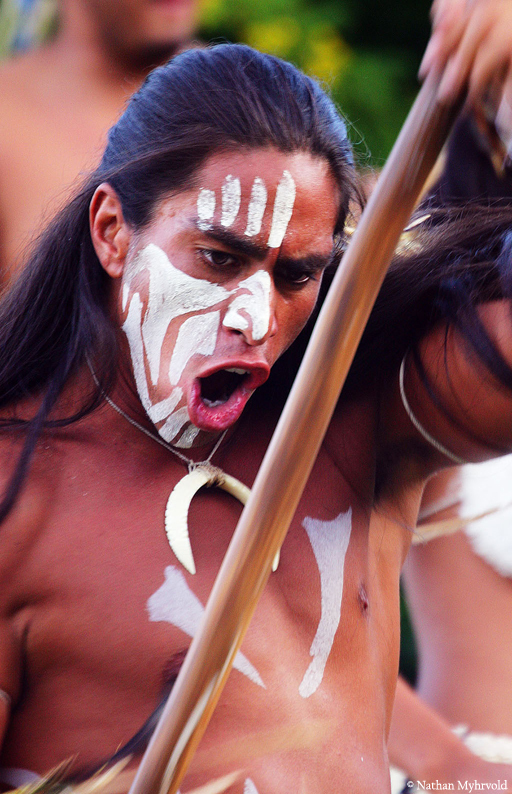 Today, the rich legacy of Rapa Nui body art is a living part of performance and cultural events, including especially the yearly festival known as Tapati Rapa Nui. Traditional designs are favored, but exciting innovations in style are also often seen. Kaeppler, A. L. 2008. 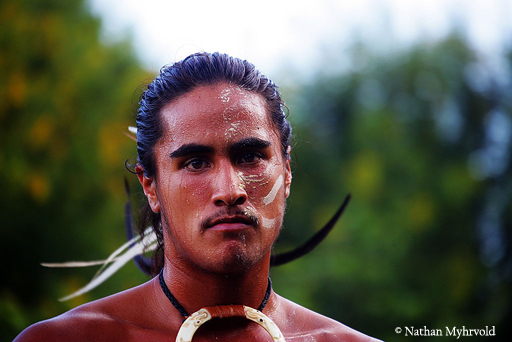 The Pacific Arts of Polynesia and Micronesia. Oxford: Oxford University Press, Oxford History of Art. Van Tilburg, J. 2006. Remote Possibilities: Hoa Hakananai’a and HMS Topaze on Rapa Nui. London: British Museum Press. Stolpe, Knut Hjalmar. 1899. “Über die Tätowirung der Oster- Insulaner.” In Festschrift für A. B. Meyer, edited by K. M. Heller. Abhandlungen und Berichte des Königl. Zoologischen und Anthropologisch-Ethnographischen Museums zu Dresden 1899, band 8 (6): 1–13. Berlin: R. Friedländer & Sohn.